We moved house a couple of months ago, and our new kitchen came with a fitted microwave. We’ve been using it every day. Sod the rays. Microwaves are so practical! We’re living with our mobile phones permanently attached to our ears. We’re breathing in the fumes of London. I drink wine. In the scheme of things, how much more damage are a few microwave rays really going to cause? 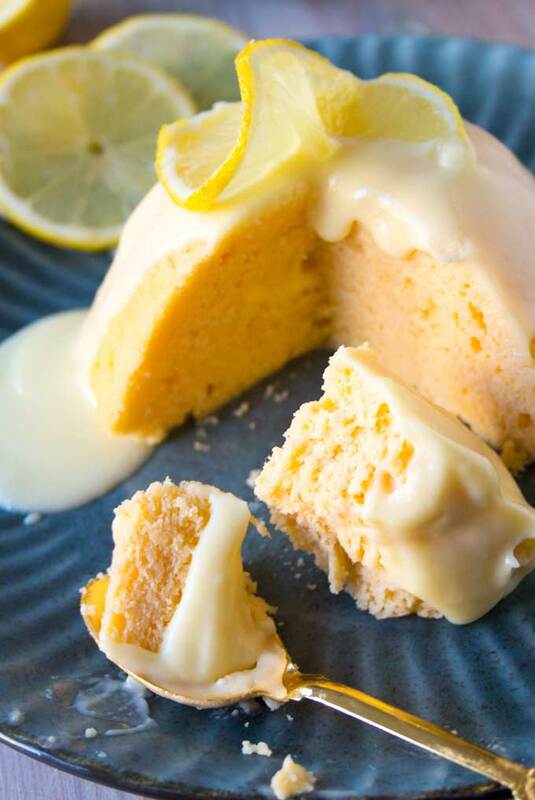 Especially when a microwave can produce such a wonderful thing as a sugar free lemon mug cake! This mug cake, my friends, is a revelation. 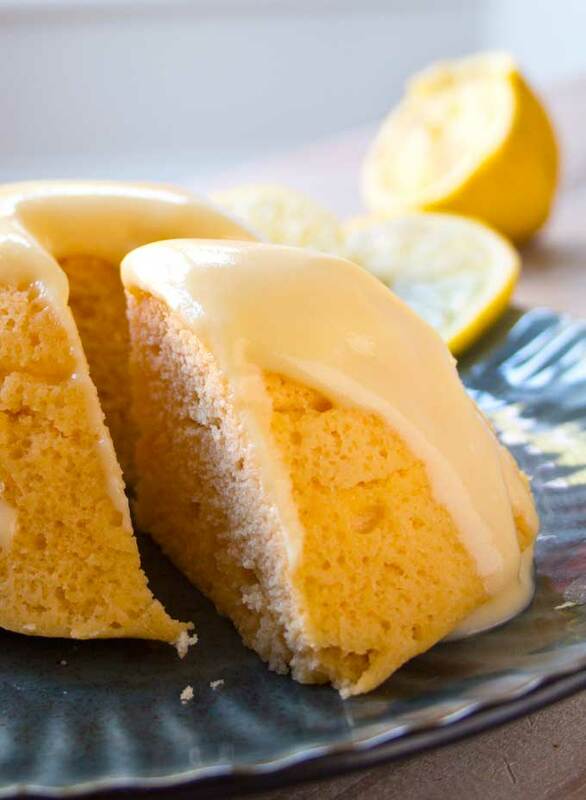 To think that you can make a perfectly delicious, super easy lemon cake that’s ready in 3 minutes! By the way, my first attempt at making a cake in the microwave was this divine Low Carb Christmas Pudding. 1.) 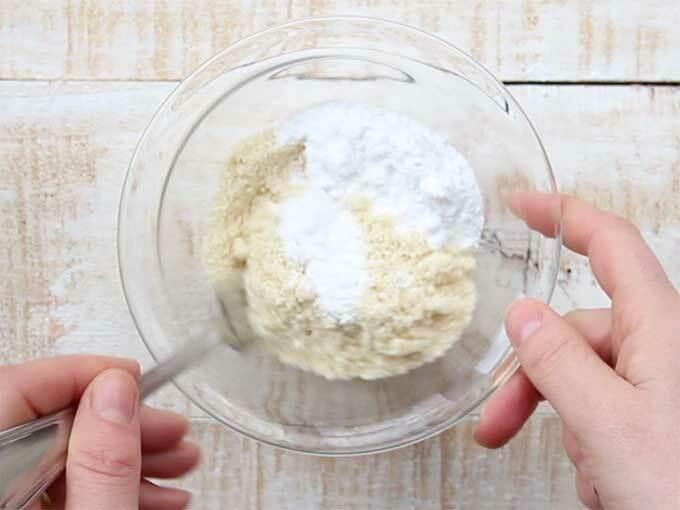 Mix your dry ingredients – almond flour, powdered sweetener and baking powder. Powdered sweetener works better than granulated sweetener in this recipe. You can make your own powdered sweetener by blending your granulated sweetener in a food processor or in the attachment of your stick blender. 2.) 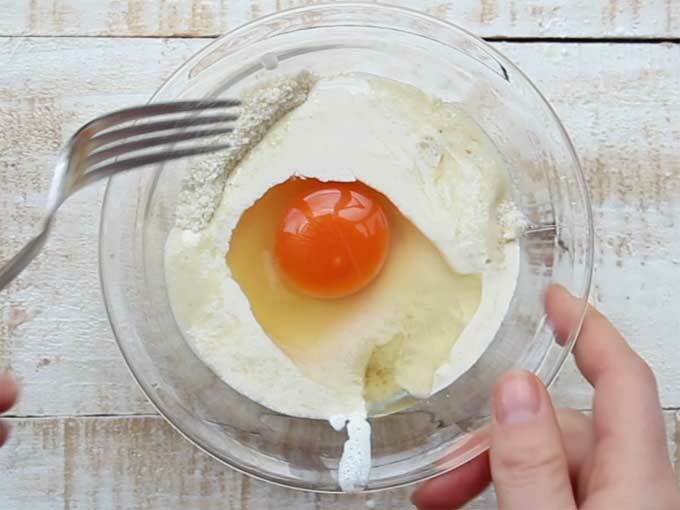 Add your wet ingredients – lemon juice, cream and an egg and mix with a fork. 3.) 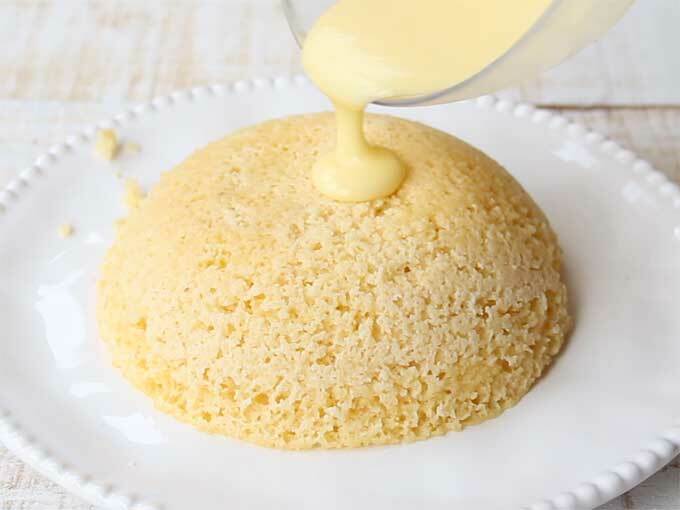 If you want to turn your lemon mug cake out onto a plate later, transfer the mixture into a bowl or ramekin which you have greased with melted butter. Or separate the mix into 2 mugs. 5.) 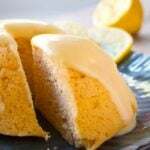 Now you turn your lemon cake out onto a plate and top with your lemon drizzle glaze, which you have made with melted butter, cream, a squeeze of lemon juice and powdered sweetener. 6.) Serve and enjoy! Hard to believe this is a sugar free cake, right??? My kids, who are by default brutally honest, absolutely loved it. The cake I shot the recipe video of I shared with a diabetic neighbour who popped by. She also gave it a thumbs up 🙂 I think this is proof enough – lemon mug cake is officially a THING! I think the portion size is quite generous. If you’re not ravenous, you could easily share this mug cake between 4 people, especially if you’re making it with the glaze. I have, however, calculated the nutrition for 2 servings. You should definitely NOT skip the glaze, because it propels the cake from a delicious dessert into a decadently delicious dessert. If you wanted, you could even poke little holes into your lemon cake after you take it out of the microwave. That way, when you pour over the glaze it sinks into the holes and makes the cake even more moist and yum. If you’re adventurous, you can even add some poppy seeds or grate some lemon zest into the batter. I’ve made this cake with both fine almond flour and with ground almonds. 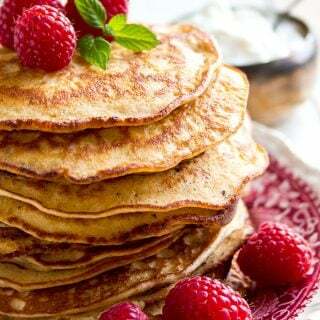 If you use almond meal or ground almonds, which are coarser than fine almond flour, add 1-2 additional tablespoons of it so your batter isn’t too liquid. 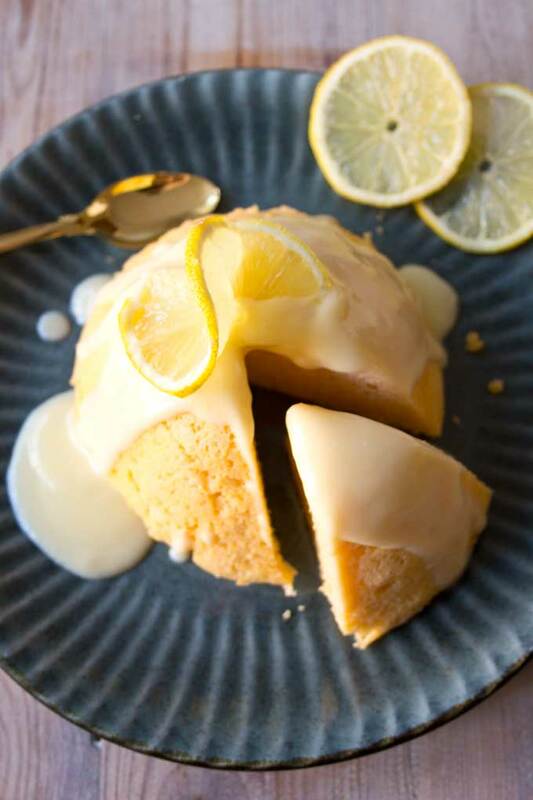 Big flavour, light texture and ready in 3 minutes: Try this easy sugar free lemon mug cake with a deliciously zingy lemon glaze. For the cake: Mix all dry ingredients - almond flour, sweetener and baking powder - in a separate bowl. My cake turned out bitter. I used So Noirished Monk Fruit Erythritol Blend in the measurement you gave. I used the same sweetner in the glaze and it tastes good. I’m not sure where I went wrong. Hi Tammy, the only ingredient that could taste bitter would be the lemon zest, if you grate in too much of the white peel. Or if you use waxed lemons, which means you might be able to taste the wax and chemicals. Or your almond flour was old and has gone off. You should always store it at room temperature if you’re not using it often. Do you think it could have been any of these? WOW!! Thank you so much for this delicious recipe, Katrin! It is truly the best mug cake that I’ve ever made – so good!! The texture was light and fluffy and the lemon flavour was just perfect. I added the zest of one lemon, and replaced the cream with coconut milk. I also skipped the glaze, but I didn’t miss it at all. I plan to try making it with tigernut flour, in place of the almond, next time around. 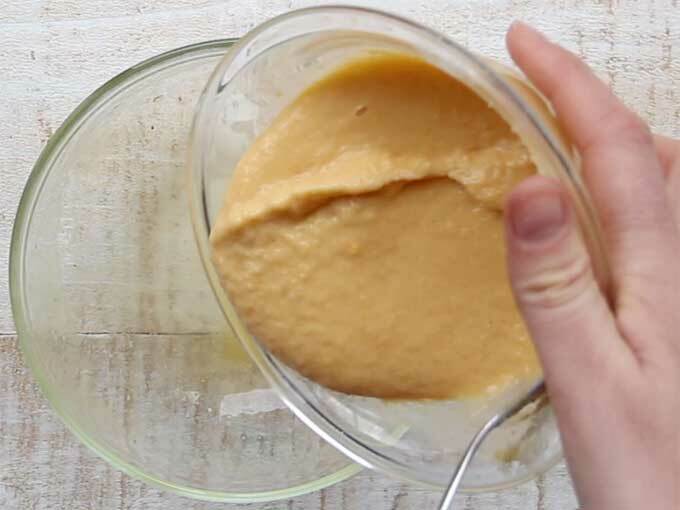 I love your easy to follow instructions and this lemon pudding was so quick and easy to make and best of all – it was delicious! That’s so good to hear Karyn! Thank you for your kind words. Tried the recipe 2 times and both times failed. Followed recipe to a T. 90 seconds wasn’t long enough so 2nd time it only was done around the edges. Please advise, we love lemon deserts. Hi Gayle, I’m so sorry to hear this! If you measured all ingredients, then I can only think your microwave must be less powerful and you may need to increase the time you cook it. Hi Katrin, just made this before going to bed LOL it’s very yummy . Did you post macros anywhere?. Just made and ate, wonderful taste and texture. Used bottled lemon juice and confectioner sugar to sweeten. Great recipe to play with and no huge processed leftovers to gorge on. Yes, I think cream cheese could work in place of the heavy cream – I haven’t tried it, but they have a similar consistency. Not usually a mug cake fan – they leave me a bit ‘meh’ – but fancied something lemony! Just made this, & as I fancied a big lemon hit, I doubled the lemon in the cake & sauce (will add zest next time, but my lemons were a bit aged!!) ….. so then I needed to add more almond flour to get it less runny…… cooked for about 3.5 mins in micro (coz it was maahhooosive!!) Turned it out into a bowl, stabbed it, & drizzled the sauce over…… lush!! It will make 12 servings for me, as it’s super filling….. but just served it with sour cream and a handful of blueberries & can honestly say it’s one of the tastiest sweet things I’ve eaten on keto…. So thank you very much! Thanks for sharing your microwave timings for doubling the recipe!! And I love it that you loved it!! This is delicious, Thank you! Mine was wet also, I nearly used less liquid but made it per recipe, except I added shredded lemon zest and used 1 TBSP of swerve. very tangy, delicious, just about perfect, even very moist. I made this cake today. The lemon flavor is great! But mine was quite wet when it was still a batter. Since I had followed the directions completely I went ahead and cook it and it was of course quite soft. The cake itself turned out quite flat not nearly as beautiful as your picture. Like I said the flavor was good. If your batter did not have the same consistency as mine (shown in the video), you should add more almond flour next time. Awesome recipe!! 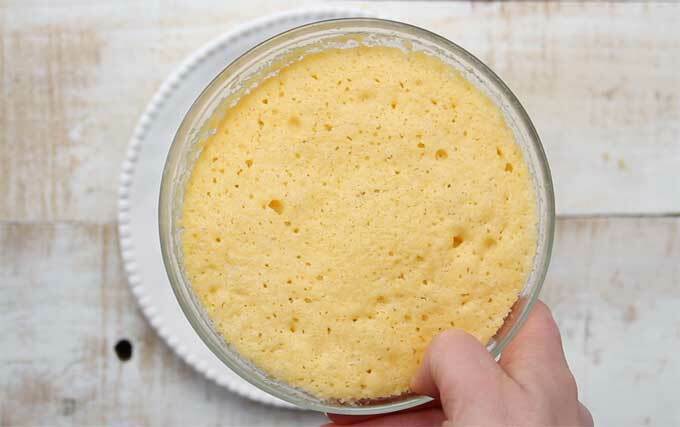 The best Keto friendly mug cake I’ve made (and I’ve tried a few). I’ll try the lemon zest and poppy seeds next time! When I made mine, I sprinkled a little unsweetened medium coconut over top. It created a wonderful texture and just added a little extra to the look! Thanks for creating this recipe!! I have made this last month December 2018, and it’s divine!! So easily in large mug,then slice in 1/2 once its sits for like 30 seconds cool down. Love it!! I figured this would be like all the mug cakes I’ve made before, decent but nothing to rave about. I was so WRONG! This was sooo delicious. I made a banana variation of this, substituting banana extract and almond extract for the lemon juice. Amazing!!! Just made this. Absolutely lovely!! I’m such a citrus freak and have been missing a good lemon cake. This hit the spot. Hi Alyssa, it’s 2 servings – I always find almond flour to be quite filling. You could try using ramekins next time, if you have a couple (I did this for my chocolate chip mug cake), or tea cups. Glad the cake hit the spot!!! I only Have granulated sweetener. Would that not work for this recipe? You should be fine using granulated sweetener too. Because it’s heavier, you might need a little less of it. Just try your batter and see what you think! If you run your granulated sweetener in a food processor for a few minutes in pulse position it turns into a powder. Absolutely delicious, I’m on a keto diet and was craving for a cake, I made it and it was gone in seconds. Thank you. this was great..and I mean great!..made it tonight. Company worthy to make! added the poppy seeds..elegant look..so fast to make…..
Glad you liked it Linda!! What an exceptional treat! I’ll be making this again…maybe in an hour! Oh my goodness this was delicious. My husband and I shared it but I think next time we will each have one. I might use some lemon zest to add a zing. Couldn’t post a picture because it didn’t last long enough lol. Enjoyed it with a cup of Lady Grey tea. Thank you! You’re welcome! We also found it hard to share, haha 🙂 I agree adding lemon zest would be great here. I might add that as a suggestion in the recipe. Thank you for your comment! Added poppy seeds and followed the recipe step by step. 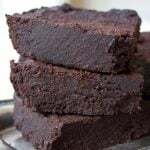 This cake is really moist and so easy to make. A keeper! I love poppy seeds in lemon cakes as well. Happy the cake turned out well and that you like it! This looks delicious! And I use powered swerve instead of erythritol? Swerve is the only powdered sweetener I have right now my erythritol is granulated. Can I use regular butter for the glaze? Or will it mess it up? I only have regular butter right now. I can’t wait to try this! Hi Sarah, any powdered sweetener would work fine. As for the butter, do you mean salted butter? If so, then I’m not sure – I can imagine salted butter with chocolate, but not with lemon 🙂 Maybe use more cream instead? I tried this out got the first time tonight. 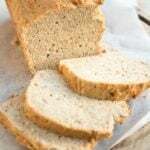 It also turned out wet and crumbly but on reading the author’s comments about the almond flour, I realized mine was quite coarse – not fine and dry. It was delicious all the same. I didn’t even wait for the glaze to cool down… but I will try this again until I get it perfect! I love eating my cakes straight out of the oven… Glad you liked it, even if it was crumbly. 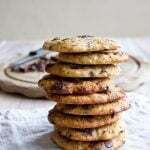 Almond flour can differ so much in texture. Fingers crossed next time you’ll nail it! I also had the problem of it coming out too wet. I tried putting it in the microwave a bit longer and it didn’t really seem to help. I wondered if it had anything to do with size of egg maybe? I used a large egg. Do you think that would make a significant difference? The flavor is still really nice. I loved how simple and quick it was to make as well. Hello Holli, I think it cannot really have anything to do with the egg, because if you’d microwave it for long enough it would set eventually. If the recipe contained too much egg if would taste eggy, that’s the only disadvantage I can think of. I think it may have something to do with the almond flour you used. Brands can vary quite a bit in texture. The one I used is super fine. 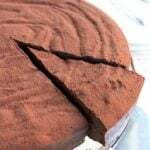 If you used almond flour that is ground coarsely it would absorb less moisture and your cake might end up soggy. 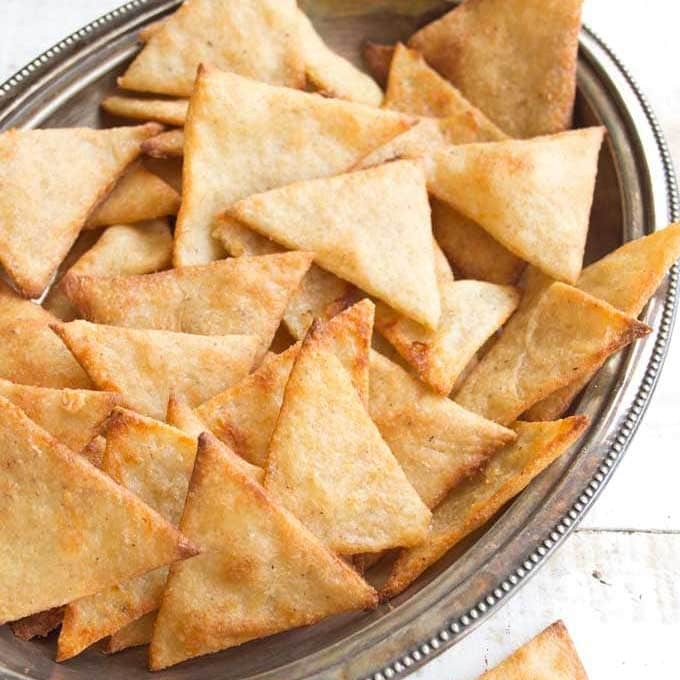 Next time you use the almond flour you have in this recipe, try reducing the amount of liquid (a bit less cream, a bit less lemon juice).That should do the trick. 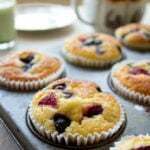 Or try out the almond flour I used (Sukrin) – you can get it on Amazon. I hope this helps. I used a duck egg which is very late and mine came out wet as well but tasted great. This was delicious! My favorite mug cake so far. I made it in two ramekins and the only problem I had was that it came out quite wet and fell apart a little BUT it may have been my fault because I didn’t have heavy cream and had to use 1/2 & 1/2. It was still absolutely delicious and held its shape well enough, was just very soft. For the glaze, because I didn’t have powdered sweetener I used stevia drops and to keep it from being even thinner (due to using liquid), I subbed lemon essential oil drops for the lemon juice. It was a thin glaze, but very delicious. Can’t wait to make this again. I topped it with a little bit of whipped cream and shared it with my non-low carbing husband and he said it was very good and he’d love to have it again. Thank you so much for sharing the recipe! Great news! I’m glad you liked it. This looks very good. Can I use coconut oil, or butter instead of heavy cream? I think that would work, too. It’s all about getting the wet/dry ratio right. Wow! 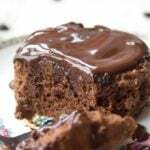 Awesome fluffy cake recipe; and low carb, too. Super impressed! Delicious! It turned out perfectly. I am happy to have this sweet treat. One question: is the fat content correct in the nutrition section? It looks off to me. Lemony, buttery, light and moist!! Delicious! Thank you for the recipe! I did use 1 tbsp coconut flour in place of one of almond flour. I find that it gives it a better flavor. Glad you liked it! And good to know it works to mix flours.Thanks for sharing! Just tried this..was a bit grainy is that typical of almond flour? I did use super define. Almond flour is a bit more grainy than regular (wheat) flour. That said, brands differ a lot. Some are ground coarser than others. From my experience, the finest flours are the ones that are cold pressed, i.e. where the fat has been extracted. It is lighter in colour and very fine. 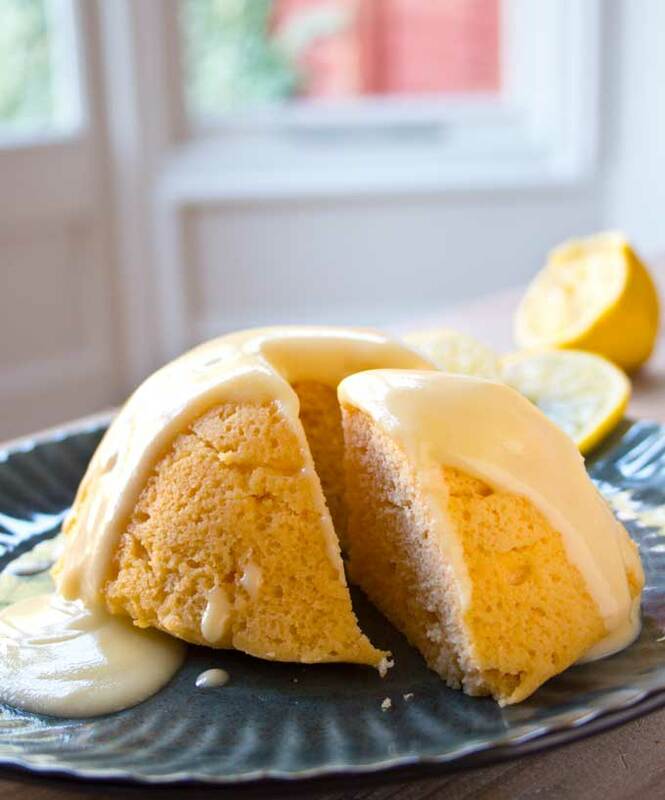 1/13/18 QUESTION… I LOVE this Lemon Mug Cake recipe. I’ve made it three times already. It’s turning out very acidic for me. I don’t want to lose the lovely texture of this cake, so how can I lighten up on the lemon juice but keep the cake the same? Maybe minus 1 Tbsp lemon juice, and add 1 Tbsp half-and-half/cream? For sugar I am using Swerve brand confectioners sugar (sugar-free sugar). Of course, you can try that. A long as the dry/wet ratio remains the same, it would turn out the same texture. Everybody has different preferences, so it’s always great to experiment with recipes a bit until you figure out exactly how they work best for you. I’m glad you like the cake!! Oh, my. I just tried this and followed the recipe to a “t.” It was very mushy and fell apart when I tried to remove it from the bowl, so I scooped everything back in and microwaved it another 30 seconds for a total of two minutes. I have a large, powerful microwave, so it’s not that. Any ideas as to what I can do to fix this? Hi Deborah, I’m sorry to hear this. It must have something to do with either the quantities (did you use measuring spoons to measure the almond flour/cream) or the type of almond flour? 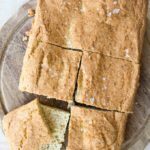 The almond flour I used for this recipe is very fine, so if you were to use regular ground almonds like the ones you can buy in the supermarket baking section, for example, you would end up with a grainier texture that might tend to fall apart. I hope this helps? Can’t wait to try this and several other recipes of SFL! Awesome! Write me a comment when you’ve tried it. I’d love to hear how you liked it! I had a craving for it as soon as I saw it! But no almond flour so I used chesnut flour… amazing! So subtle… thanks for the recipe! Mmmmmh, chestnut flour! Makes it kind of Christmassy, too… nice. Looks delish! 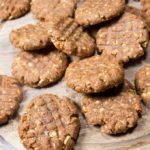 Is there an alternative flour I could use? I was wondering the same thing. I don’t see why not. I just read another comment that coconut flour was used and it turned out great. Another great recipe, Katrin. Thank you so much. I never thought I’d get into mug cakes, but you have certainly changed my mind!!! They have kinda changed my life, haha! I made this cake this afternoon when my mum came over and we loved it! She’s a type 2 and still loves her sweets.It was great to be able to serve her something that’s good for her AND tastes great. How wonderful! What I love about these mug cakes is that you can make them with minimal effort and at short notice (provided you have the right ingredients). If you see her again during the Christmas season, you could try my Low Carb Christmas Pudding, which is also a mug cake! Yes you can! I haven’t tried it but would go with 180 Celsius (nut flours bake at lower temperatures than wheat flour) for ca 15 minutes, maybe a little longer. Check if it looks nicely browned and if it’s done inside! I doubled the recipe, and only one t. Of Stevia for cake and glacé. Had to cook extra 15 min. Even though separated into two ramekins. Turned out great with these adjustments. I love mug cakes! This one looks good. Will definitely try. Thank you!! Let me know how you get on!